XVII. 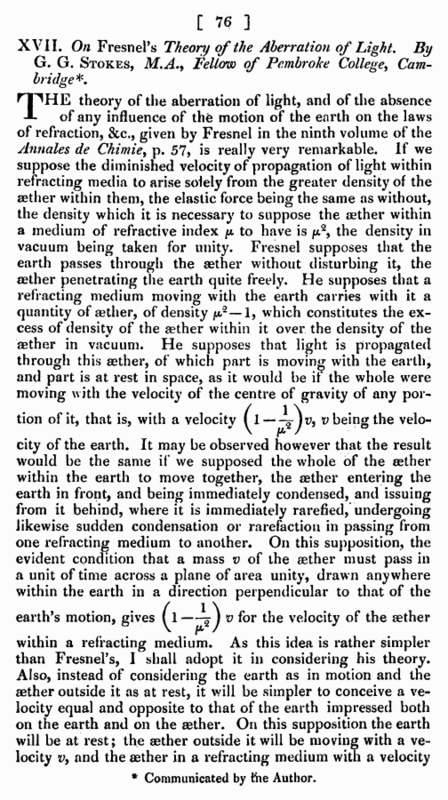 On Fresnel's Theory of the Aberration of Light, By G. G. Stokes, M.A., Fellow of Pembroke College, Cambridge *. within a refracting medium. As this idea is rather simpler than Fresnel’s, I shall adopt it in considering his theory. Also, instead of considering the earth as in motion and the aether outside it as at rest, it will be simpler to conceive a velocity equal and opposite to that of the earth impressed both on the earth and on the aether. On this supposition the earth will be at rest; the aether outside it will be moving with a velocity v, and the aether in a refracting medium with a velocity * Communicated by the Author.